JBL Professional has made a name for itself by producing great sounding, long lasting portable PA systems. With the introduction of the SRX800 line of powered portable PA loudspeakers, JBL has set the standard for what a fully professional powered PA system should be. SRX800 breaks new ground, bringing together JBL’s premium transducers and enclosures, Crown’s Proprietary Front-End DriveCore Technology, user-configurable DSP, and full HiQnet Network control compatible with a variety of platforms. 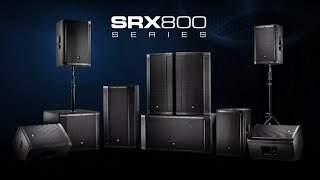 Integrating industry-leading levels of sound quality, power, control, and durability, SRX800 is a perfect all in one solution wherever high performance, comprehensive control, and pristine sound are required. Each component in the SRX800 Series was purposefully designed and thought through to deliver a perfectly tuned system that is powerful, easy to use, and rugged enough for the most demanding applications.